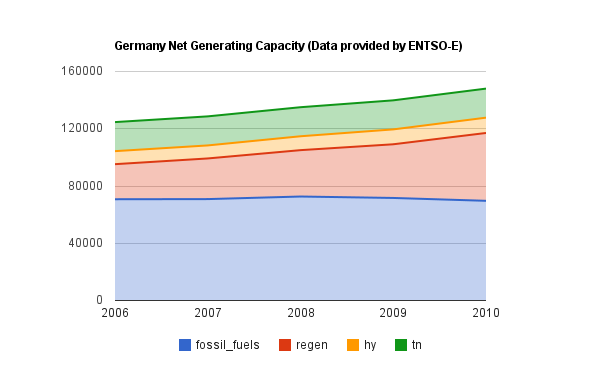 My previous post noted that the need for variable generation capacity, presumably primarily natural gas-fired, does not decrease as wind capacity increases over the next decade, although the annual generation from ‘peaking’ type sources may drop from about 20TWh annually, to 17TWh annually. [i] The decline for gas producers may be more than offset by the removal of coal-fired generation. In Ontario, it is frequently noted the costs of the feed-in tariff programs for renewable (FIT and microFIT) have not yet impacted bills. I’ll demonstrate that isn’t entirely true. I’ll explore market mechanisms required in a system that includes intermittent generation that is provided with priority purchase status; and the alternate, non-competitive, mechanisms Ontario has substituted for market mechanisms. That will provide the basis to calculate a figure to add to the accounting for the cost of Ontario’s wind strategy. That foresees for the UK what we already see in Ontario. Here we regularly see periods of excess supply where nuclear units dump power, periods where water is run over falls instead of diverted through turbines, and, almost nightly, we dump excess generation on adjacent markets. We also now have the structure for centralized wind forecasting (which we’ll pay for) in order to pay wind generators as if we purchased output when they get ‘turned-down’ due to an inability to accommodate more electricity on the grid. Costs specifically related to curtailing production I’ve estimated will start to climb towards $800 million a year by 2017, - but that figure does not account for the costs associated with maintaining capacity to meet demand when the wind is not blowing. Texas is the US state with the largest Industrial Wind Turbine output, which was, as expected, of little help to it in a hot dry summer. Prior to the summer, FERC (the Federal Energy Regulatory Commission), in its Summer 2011 Energy and Reliability Assessment, had indicated Texas’ ERCOT had the smallest reserve margin (14%) of any system in the US, and cited the average on-peak wind capacity at only 8.7% of nameplate (the capacity value). When the heat failed to break in Texas, market prices repeatedly hit the capped maximum of $3000/MWh while mothballed coal plants were called back into service. The US Energy Information Administration (EIA) would conclude (here) the underlying problem to be a shortage of reserves, with a notable assist from a lack of interconnection with other power grids. The lack of reserves is the issue we’d expect with the addition of supply that does not meet peak demand, unless another market mechanism is added. The reason we’d expect a lack of reserve supply is because of adding the intermittent source, wind, in situations where it doesn’t remove another source – which is always when it has little capacity value at the expected peak demand periods. If you have 100 units of supply capacity and you’ve priced it based on it producing 50% of the time, adding another 20 units will lower the price. If those 20 units are absent at peak, you still need the 100 units but they won’t run 50% of the time, so the cost of the plant, and infrastructure, are spread out over fewer units of production. This relationship breaks down rather quickly if you need some reliable supply built. Lower prices are a market call for reduced production capacity. The levelized cost of unit energy (LUEC) is a nice concept, but a meaningless one without being able to estimate, with some confidence, the capacity factor (CF) of a planned project. The Ontario Power Authority, for instance, cites the LUEC for CCGT plants at $65.1/MWh at a CF of 87%, but at a 30% CF they don’t quote the pricier CCGT plants, but conventional combustion turbines, with the price rising to $123/MWh. [iii] The guaranteed purchase of wind output, regardless of need or impact on other generators therefore increases the LUEC of sources demoted to a support role. Jurisdictions committed to functioning markets for electricity are developing market mechanisms to deal with this reality. In the USA, while ERCOT struggled through record peak demands this summer, the PJM market area sailed through it’s record demand without incident. A New York Times blog entry helps to explain why; generators in the PJM market “…also sell capacity: each utility that serves customers has to go into the wholesale market and buy not only energy but the actual availability of generation.” This is the flip side of devalued Watts during the productive periods of intermittent generators – paying for the capacity to generate Watts. It’s worth noting that, at least in the Pennsylvania portion of PJM (the other letters were originally for Jersey and Maryland), FITs are replaced by the market mechanisms of a renewable portfolio standard (RPS). PJM appears to be an excellent study for proponents of electricity markets. Ontario lacks the economic sophistication of the PJM market. 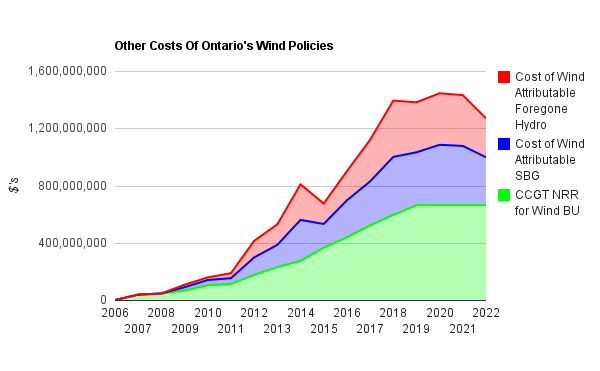 In a rush to replace coal-fired generation with wind, Ontario contracted the construction of CCGT natural gas generation by providing guarantees in the form of ‘Net Revenue Requirements’ – or NRR’s, at an average $7900/MWmonth. [v] This is the figure that is already hitting electricity bills in Ontario, because we’ve already committed to these contracts with the recent 4000MW of natural gas capacity. The CCGT plants constructed since 2007 run at well under 30% capacity factors now, and that should decline through 2014, before picking up slightly as nuclear capacity drops during refurbishments. The reason for the NRR's is the ‘clean’ renewable strategy that seeks to not use the gas generation it required to have to meet demand. The value of the wind output is dependent on the rest of the supply mix. Notably, wind is most expensive, and least utilized within Ontario, in 2014, which is the peak year for nuclear output in my model. The UK study noted increasing wind generation carried the possibility, "that this ‘crowds out’ scope for less flexible generation technologies such as nuclear and possibly fossil fuels with carbon capture and sequestration." The study didn't note that this may be the singular rationale for a wind turbine strategy. Pages 40-41 of the anti-nuclear World Nuclear Industry Status Report 2010-211 argues nuclear is not compatible with renewables because "overcapacity kills efficiency incentives", and because "renewables need flexible complementary capacity:." Wind seems to be a strikingly expensive proposition that doesn't to do anything aside from generating overcapacity at the expense of efficiency! It seems like the only thing it does do is make baseload generation, specifically nuclear, unprofitable - and it seems likely that is precisely the objective the pushers of wind have. [i] Calculations per my model, ending in 2022 – assumes no new builds of nuclear are operational prior to the removal of service of Pickering’s 3000MW. Solar production not in model. Hmm it looks like your site ate my first comment (it was super long) so I guess I'll just sum it up what I submitted and say, I'm thoroughly enjoying your blog. very same area of interest as yours and my visitors would definitely benefit from some of the information you provide here. Hey there. I'm wondering if you may be interested in doing a website link swap? I notice your blog: http://www.blogger.com/comment.g?blogID=9082786308862898980&postID=8020295361493438154 and my blog are centered around the same subject. I'd really like to switch links or perhaps guest author a article for you. Here is my personal contact: lutherrodriguez@inbox. com. You should contact me if you're even slightly interested. Many thanks. the best quality for my visitors. for the same thing. Your blog, "Blogger: Cold Air" and mine are very similar. It will certainly help gain publicity to your website (my site recieves a lot of visitors). If you happen to be interested, email me at: leesa-goulet@yahoo. screen in Safari. I'm not sure if this is a format issue or something to do with browser compatibility but I thought I'd post to let you know. your post seem to be running off the screen in Firefox. Iím not that much of a online reader to be honest but your sites really nice, keep it up! your blog title: Blogger: Cold Air. Please let me know if this is ok with you. sure if it would yield any positive results. Many thanks. domain name: http://www.blogger.com/comment.g?blogID=9082786308862898980&postID=8020295361493438154 and guess who already acquired it? but realized it had been taken so I decided I'd come check it out. Wonderful blog! I've a challenge that I'm simply now running on, and I've been on the look out for such information. It's really a great and helpful piece of info. I am glad that you shared this helpful info with us. Please stay us up to date like this. Thank you for sharing. Hi! This is my first comment here so I just wanted to give a quick shout out and say I genuinely enjoy reading through your articles. him... lol. So let me reword this.... Thank YOU for the meal!
! But yeah, thanx for spending time to talk about this issue here on your website. the responses on this page "Beyond Oxford: Capacity Markets and $263/MWh IWT Output". I actually do have 2 questions for you if you don't mind. Could it be only me or do a few of the remarks appear like they are written by brain dead individuals? :-P And, if you are writing on other social sites, I would like to keep up with anything fresh you have to post. Would you list of every one of all your social sites like your Facebook page, twitter feed, or linkedin profile? you make running a blog glance easy. The full look of your site is fantastic, let alone the content!